Middle College students have opportunities to take classes that meet their career or college interests, they're surrounded by individuals who are motivated to attend college, and they're given the responsibilities of a college student. Interested in a small learning community where their presence is felt and has impact...where they matter. "In order to be successful in a college atmosphere, it takes perseverance, commitment, and dedication. Many people take advantage of having so much freedom, but independence has taught me the boundaries for myself as well as better time management." "I have absolutely loved every minute of Middle College; it took me out of the high school scene and into a place where I could be around mature people, and I could be responsible for my education." "I learned and grew a lot. I loved going to school again and I felt comfortable with the atmosphere and fellow students. I was able to focus on my future goals and make them more specific." "Coming to Middle College was the best decision I made during my high school years. My only regret was that I didn't come here sooner." "Before this program, I was a shell of a person. I went through the motions that high school requires with no emotion, no passion, no interest whatsoever. This program has given me much more freedom, the leeway to mature and the ability to take responsibility for myself and, as a result, I have developed my own sense of direction." "Middle College created a tight "family" in some ways that high schools couldn't. I think we had a great class as well. Everyone was needed to make this a complete experience. Unfortunately, things come to an end, but this end made way for even more beginnings than we would have had elsewhere. It wasn't the "program" that was successful, it was the people (teachers included)." "I know what it is like to attend a college and I am very clear about what I will do in the future. I know I would not have been this clear about my future if I had stayed at my previous school." "I like how teachers actually enjoy teaching; they want to be here. You guys don't just accept your jobs because you're too old to find ones that interest you more. You were made to teach, and that's very important." "High school was just a place for me to lose myself and walk around in a daze. Middle College snapped me out of it and reminded me that I wanted to go to college. I honestly don't know where or who I would be if I hadn't come up to CSM for this program." Most people don’t start cycling with the goal of riding across the country. Eighteen-year-old Megan Ryan kind of did. She was given the bike as a birthday gift a couple years ago. She rode it often, but mostly back and forth to work — about a mile away. Nothing too intense, but Ryan enjoyed it. 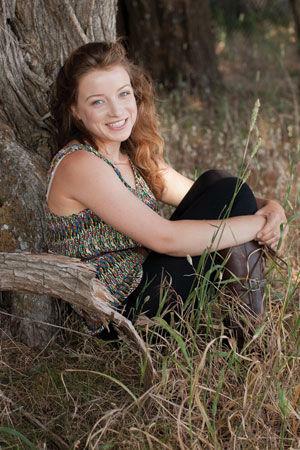 The University of San Francisco student who is studying environmental science and education also enjoys traveling. Given her area of study, she worried about the resources spent when one travels long distances. But she hadn't considered taking a bike for a long ride until meeting a guy in Portland who had traveled on two wheels from Indiana to Oregon. After searching the web, the 2011 Aragon High School and San Mateo Middle College graduate came across Bike & Build — a nonprofit that organizes cross-country cycling trips to benefit affordable housing in the United States. “I’m rushing into going from a total novice to a cross country trip,” she said. This summer she'll travel with the organization from Virginia Beach, Virginia to Cannon Beach, Ore. On the 3,800-mile trip, Ryan will do a handful of 100-mile days with the group. The group stops along the way to raise awareness about affordable housing organizations and help build housing. Ryan has pledged to raise $4,500, which will help the organization and trip costs. Ryan grew up in San Mateo as a curious youngster who liked to play softball and water polo. She enjoyed volunteering with special education students at Sunnybrae Elementary School. Ryan decided to leave the traditional high school setting in favor of San Mateo Middle College to take advantage of the opportunity to customize her high school experience. As a result, Ryan graduated high school with 40 units and is on track to graduate college in three. After learning of the opportunity bike long distances, Ryan looked for groups. Bike & Build stood out to her as she had studied the struggles of affordable housing previously. Over eight years, the nonprofit contributed $3.4 million to housing projects, according to its website. She applied just days before the deadline and was accepted. Since then, training has been in full swing. She's riding at least two hours a day, taking cycling classes, doing rides with more experienced riders and simply trying to be extra active. She recognizes it will take a lot to build up to riding for five to eight hours a day. The learning curve is also steep, including falling in San Francisco and asking basic questions to other riders. Buying equipment, which is often expensive, is also a challenge. Ryan’s relying on the advice of others to make the right choices. And, to help her become more comfortable with her bicycle, Ryan has started to volunteer at a bike repair shop on campus. Although her friends and family were initially surprised by the idea, they have been quite supportive. Ryan’s keeping a good attitude about it. “I’m so excited and any help would be great,” she said. Luis Carlos initially attended CSM as a Middle College student in his junior year of high school because he needed more academic stimulation than regular high schools offered. By graduating, he became the first in his family to earn a high school diploma. He decided that his best course of action would be to continue to attend CSM as a college student with the goal of transferring. As an astrophysics major, he needed great resources like the Math Resource Center, the Integrated Science Center, and the Learning Center on campus to aid him in his studies. With so much aid, wonderful professors, and a supportive administration, CSM became the place he grew academically, intellectually, and personally. Thanks to his astronomy professors at CSM, who are collaborators in the San Mateo Arctic Research Telescope (SMART) Project, he received an internship in the Arctic Circle with the Haughton-Mars Project and NASA through CSM. This experience helped him establish a firm foundation for my studies at CSM and eventually Stanford University. He recommends that prospective students take advantage of the tremendous resources offered at CSM, such as the transfer services, financial aid, admissions, counseling, and the host of centers for studying; all have been pivotal to his success and satisfaction at CSM. At Stanford University, Luis will engage in physics, math, astronomy, and computer programming classes that will increase his understanding of astrophysics; he hopes to pursue a Ph.D. in the area and lead research concerning extra-solar planets -- planets outside our solar system. Luis says that, "CSM laid the foundation for my success; if you work hard, study hard and thrive here, I guarantee it can do the same for you."